On paper Charles's credentials were superb, with his wool classified at 14.5 microns. 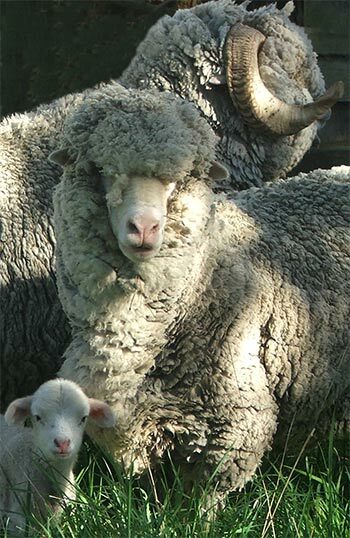 The champion Australasian merino sire Sir Thomas was a woolly sort of grandfather. His first few days in the front paddock weren't encouraging, though. I was primed and ready to take rather a tough line, holding a large stick, just to show who the boss was. Charles hid in the Pittosporum hedge and refused to come out. Obviously he was impossible to photograph. So a group of selected ewes were trucked in to give encouragement. And, naturally, Charles blossomed. 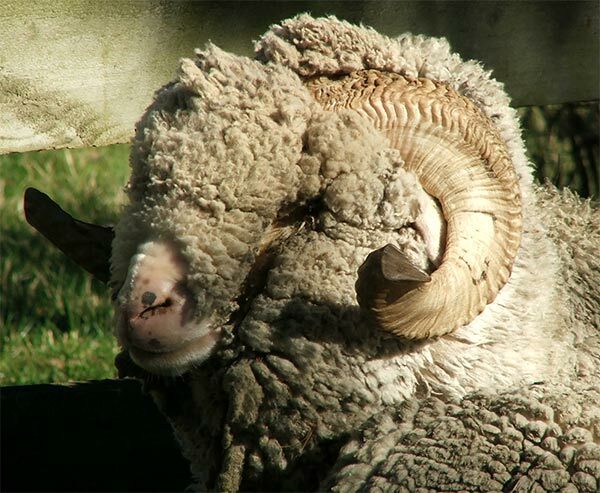 Now he's an easy-going ram to work with, confident as long as he has - ahem - female company. And he - ahem - does the business. These pictures are from his first official photo shoot. The spring of 2006 at Mooseys should have been full of bleating new merino lambs, carrying on Charles's impeccable bloodline. Some of the ewes had other ideas. There were a few problems, and unfortunately we lost two lambs. We were able to rescue the second lamb born, after ewe no. 98-346 simply lost interest and walked off. Our lovely pet lamb is named Haru, and she's beautiful, with the softest wool I've ever felt! She's starting to eat flowers (eek - my poor pansies), grass, and the oddest plants in my garden - the tips of Lychnis leaves are apparently a gourmet delight. The surviving boy-lamb already has a glittering career mapped out. It's difficult to say this with delicacy - boy-lamb, when grown, is required as an apprentice ram at another small farm down the road.